We watch A LOT of movies in our house and frequently have “movie nights” where we watch two or three of them back to back. John has a collection of over 2000 VHS movies so there never is a shortage. And of course what goes with movie night? You got it- snack food! 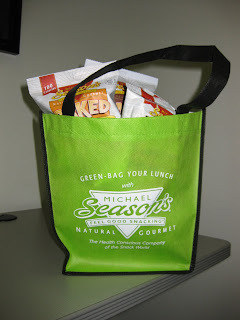 We were psyched to try out some single-serve snacks from Michael Season’s. They are a family owned and operated company that specializes in organic and natural snack foods. All their products are gluten and wheat free (great for those with Celiac disease or gluten sensitivities) and natural and have reduced fat. Not only that, but they taste great too! We received four products to try out: Original Multigrain Chips, Sweet Barbecue Potato Crisps, Cheddar Cheese Curls and Cheddar Cheese Puffs. Our favourites were the Cheddar Cheese Curls and the Cheddar Cheese Puffs. They are so yummy and LOVE the cheesy flavours. We love cheese puffs and were happy to find out that they have 50% less fat than our regular brand. Some natural foods lack on flavour, but these definitely do not. They are delicious and at only a 100 calories a serving, there is no feeling guilty afterwards. The Original Multigrain Chips were also good and had a nice flavour and texture.The Sweet Barbecue Potato Crisps were also tasty. They reminded me of the cracker- Crispers. The single serving packages are the perfect size for a kid’s lunch snack. John said he wished the packages had more in them because he has a big appetite. I thought they were just the right size for me. To purchase, please visit Michael Season’s. I looking for soe healthy snacks.